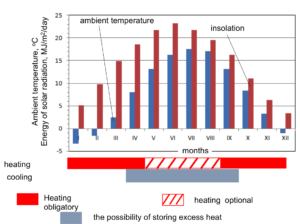 In the years 2010-2015 at the Faculty of Production and Power Engineering of the University of Agriculture in Krakow and the Institute of Horticulture in Skierniewice project research and implementation was realized in the field of energy storage in batteries surplus heat from inside the foil tunnels. Three types of materials were used for the energy accumulations in the special constructions. The research was conducted with stone, liquid and phase change material. 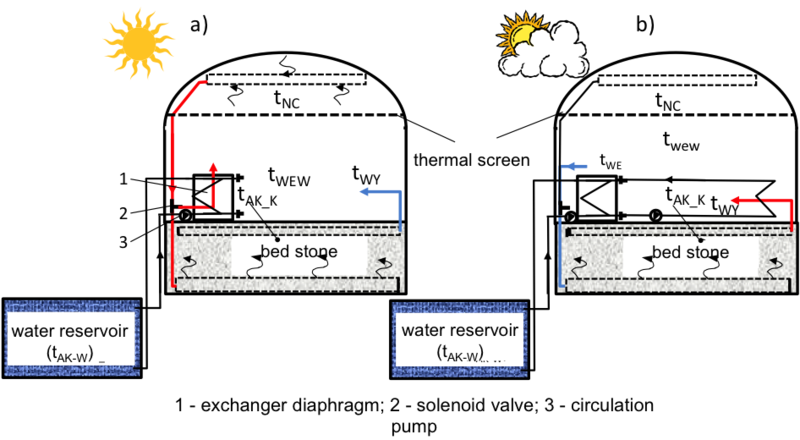 The idea is based on battery life by blowing during a temperature in excess of plant requirements, warm (charging period) and the period of demand for heat, cold air (discharge process). Battery stone (bed filled with stone porphyry type size 35 to 60mm) must be made to ensure the proper insulation of the walls and the sides of the battery. The design of the battery plants (prepared as patent pending) has been awarded medals for innovative solution shows in Nuremberg and Brussels. The idea of work bed stone accumulator consists of storing heat in the stone bed in times of high air temperatures and unloading when the temperatures are too low for crops. In addition, the battery can be used to cool the plant during the morning rapid temperature rise inside the building. An integral part of the battery, in addition to cables, the bed, the fan system is controlling the position of the steering damper air flow. The bed stone accumulator has four independent, equal and isolated sections. Each section has dimensions (without insulation) 1,7×11 m. These sections are located in the tunnel area of 144 m2. Schematic section of the battery (for its construction were obtained patent: Application number: 400 690) is shown in Fig. 3.
control the process of cooling the air inside the building. The analysis found that by using this system you can get an earlier and higher yield of crops, reducing the use of pesticides, reducing the consumption of fossil fuel to maintain the recommended microclimate parameters. As a result of the arrangement and keeping the recommended process parameters blow air (cycle time, a stream of forced air), payback period of the construction and operation of the system is approx. 8 years. More information can be obtained from the project contractors (prof. dr. Sławomir Kurpaska and dr. Hubert Latała – employees of the Faculty of Production and Power Engineering of the University of Agriculture in Krakow).